OBJECTIVE White matter hypoperfusion may play a part in the pathogenesis of ischaemic leukoaraiosis, but demonstration of this requires a high resolution quantitative method of cerebral blood flow (CBF) measurement. Initial exogenous contrast based MRI methods only allowed measurement of relative cerebral blood volume (CBV) values, but more recently a mathematical approach has been developed which enables absolute regional CBF and CBV to be determined. This technique was applied to patients with ischaemic leukoaraiosis to determine whether reduced white matter CBF in this patient group could be demonstrated. METHODS Eight patients with ischaemic leukoaraiosis (radiological leukoaraiosis and clinical lacunar stroke), and nine age matched controls were studied. A spin echo echoplanar image sequence was used on a 1.5 Tesla MR system. An arterial input function was obtained from voxels placed over the middle cerebral arteries. Cerebral blood flow, CBV, and mean transit (MTT) maps were derived. Regions of interest were placed at standard positions in the white and grey matter and mean values of CBF, CBV, and MTT were compared between the two groups. RESULTS Mean (SD) white matter CBF was significantly reduced in patients by 38% (13.40 (4.87) v 21.74 (3.53) ml/min/ 100 g, p=0.002). Significant reductions in CBF were seen in all white matter regions. By contrast there was no reduction in CBF in any grey matter region. There was no significant difference in white matter CBV between cases and controls; mean values were lower in all white matter regions for patients but this did not reach significance for any region. By contrast mean grey matter CBV was significantly higher in patients than in controls. Mean MTT values were higher in all regions of grey and white matter in the patient group, but this only achieved significance for the superior white matter. CONCLUSION A quantitative MR perfusion method showed reduced white matter CBF in patients with ischaemic leukoaraiosis, but normal grey matter CBF. This is consistent with hypoperfusion playing a part in the pathogenesis of ischaemic leukoaraiosis. The absolute values of white matter and grey matter CBF obtained in the patient groups were very similar to those in previous PET studies, providing further evidence for the validity of the regional CBF measurements obtained using this quantitative MR perfusion technique. The high spatial resolution and lack of radioactive administration makes such techniques ideal for longitudinal studies in this condition. For these reasons investigators have attempted to show reduced perfusion or cerebral blood flow (CBF) in the white matter in patients with ischaemic leukoaraiosis. Such studies require a quantitative estimate of cerebral blood flow, as the disease process is diffuse and may affect multiple brain regions. Semiquantitative techniques such as single photon emission computed tomography (SPECT) have been used,5 but these can only give ratios of perfusion between different brain regions, and cannot demonstrate a reduction in absolute regional CBF. Quantitative xenon-CT and PET have shown reduced cerebral blood flow in patients with ischaemic leukoaraiosis,6-8but such techniques require exposure to radiation, making them unsuitable for serial imaging studies. Recent advances in ultrafast MRI now offer the potential of combining high resolution structural imaging of the white matter with perfusion imaging. Perfusion can be determined with MRI by the use of bolus tracking dynamic imaging methods with exogenous paramagnetic contrast agents. Initial perfusion studies only allowed measurement of relative CBV values,9 but more recently, a mathematical approach has been developed to also yield relative CBF.9 After dose normalisation of the gadolinium contrast agent, and introduction of a proportionality constant derived from studies in a pig model and in humans, absolute regional CBF can be calculated from MRI with a signal to noise and spatial resolution equal or better than that obtained with PET.10 In comparisons between MRI and PET, performed both in pigs10 and in healthy humans,11 a close correlation was found between CBF measurements calculated using the two methods. In this study we examined the hypothesis that reduced white matter perfusion could be shown in patients with ischaemic leukoaraiosis using quantitative exogenous contrast based perfusion MRI. We determined whether the absolute values of CBF obtained were similar to those from previous studies using PET. We also compared regional cerebral blood volume (CBV) and mean transit time (MTT) between patients and age matched controls. We studied eight patients (seven men) presenting to a specialised cerebrovascular neurology clinic with ischaemic leukoaraiosis. This was defined as extensive confluent areas of hyperintensity in white matter on T2 weighted images, in combination with a history of lacunar stroke. All patients were studied at least 3 months after their last stroke to reduce an influence on cerebral perfusion patterns from diaschesis after an acute event. Mean time since last presentation was 2.9 years (range 1–7 years). Treated hypertension was present in six and five were ex-smokers or current smokers. None had diabetes. Five had evidence of mild cognitive impairment on routine neuropsychological testing. Three had had only single clinical lacunar strokes and the remainder had experienced recurrent events. Carotid stenosis (>30%) was excluded in all by duplex ultrasound. In addition, we studied nine age matched normal controls (eight men) of whom two had treated hypertension, but none had diabetes. These were recruited from a community volunteer database from the same geographical region as the patients. Patients with a history of stroke, transient ischaemic attack, or cognitive impairment were excluded but patients with vascular risk factors were included. Six were current or ex-smokers. Mean (SD) age was 63.3 (12.3) in patients and 68.7 (7.3) in controls (p=0.300). All patients gave informed signed consent and the study was approved by the local hospital ethics committee. A 1.5T GE Signa (GE Medical Systems, Milwaukee, WI, USA) system fitted with Advanced NMR (Wilmington, MA, USA) hardware and software was used. Before subjects were placed in the magnet in the supine position a 16 gauge cannula was inserted into an anticubital vein. In six patients and all controls end tidal carbon dioxide monitoring was performed throughout the procedure; a nose clip was fitted to ensure that the inhaled gas was derived solely from a mouthpiece which was in place throughout the scan, and was fitted with a one way valve to separate inspired and expired gases. An 11 slice SPGR sagittal localiser image was acquired (TR=150 ms, TE=42 ms, α=90°, Δx=Δy=0.94 mm, slice thickness=5.0 mm, slice gap=2.5 mm). The localiser image was displayed and used to prescribe image planes for the perfusion study. Five axial slices were prescribed though the region of interest, with the centre of the second uppermost slice aligned with the superior aspect of the corpus callosum. Two additional near axial oblique slices were prescribed to ensure that one intersected the middle cerebral arteries (MCAs). To check that one of the lower slices intersected at least one of the MCAs, a single seven plane spin echo (SE) echoplanar image (EPI) was acquired, (TR=1.52 ms, TE=90 ms, α=90°, Δx=Δy=1.6 mm, field of view 400×200 mm, slice thickness=5.0 mm, slice gap=2.0 mm). This procedure was repeated if necessary, with the two oblique slices repositioned, until the MCAs were clearly seen within one of the slices. Next, the subject was asked to close his or her eyes, and a series of 70 consecutive multiplanar SE-EPIs were acquired (dummy scans=4, TR=1.52 ms, TE=90 ms, α=90°, Δx=Δy=1.6 mm, slice thickness=5.0 mm, slice gap=2.0 mm) with the subject breathing air. During image acquisition, end tidal CO2 measurements were recorded. Contrast agent (Omiscan, Nycomed Imaging) at a dose of 0.1 mmol kg-1 was delivered at a rate of 5 ml/s using a MR compatible power injector (Doltron), commencing on the 20th image in the series. Contrast agent administration was followed with a 10–20 ml saline flush, depending on the weight of the subject. There were no significant left to right differences and therefore values from left and right regions of interest were pooled. Mean grey and white matter values were obtained by averaging values from the frontal, parietal, and occipital cortical regions and the three white matter regions respectively. Data for the frontal and occipital grey matter were pooled, as were the data from the periventricular white matter, and the same comparisons made as for the individual ROIs. Mean values were compared between patients and controls using an unpaired two tailed student's t test. In view of the multiple comparisons made a significance level of p=0.01 was used. Two potential problems which could invalidate the CBF measurements were blood-brain barrier breakdown and a ΔR2 time curve is delayed relative to the arterial input curve in some patient subgroups. Therefore data analysis was also performed to determine whether there was any evidence of white matter blood-brain barrier leakage in this condition which would invalidate the assumptions made in CBF estimation. These assume that the tracer remains in the intravascular compartment. The postcontrast–precontrast ΔR2 difference was used to indicate leakage. If vascular leakage does not occur, the signal will return to its precontrast level after the bolus injection, or in the presence of tracer recirculation, the postbolus signal will be lower than the prebolus intensity. If vascular leakage occurs, the postbolus signal may be increased relative to the prebolus signal. Once the signal-time curve has been converted to ΔR2 values, recirculation would result in positive ΔR2, whereas tracer leakage would then show up as negative postcontrast ΔR2. One possible criticism of the singular value decomposition technique used to deconvolve the arterial input curve from the tissue ΔR2 time curve is its susceptibility to give erroneous flow values where the ΔR2 time curve is delayed relative to the arterial input curve, and if there is increased dispersion of the contrast agent bolus before it reaches the tissue. To investigate these two potential problems in cases and controls mean tissue signal-times were calculated for two ROIs placed in the periventricular white matter of the left and right hemispheres. The mean arterial input curve was also calculated. The signal-time curves were converted into ΔR2 time curves for analysis. For each ROI, the mean ΔR2 was calculated for the precontrast time points, and for the postcontrast time points. The postcontrast–precontrast difference in ΔR2 (diff ΔR2) was calculated as an index of vascular leakage. The mean grey matter and white matter diff ΔR2 values were then calculated for each subject. The diff ΔR2 were compared between the patients and control group using an unpairedt test. Tracer arrival time for the AICs and the tissue ΔR2 time curves was determined as the point before ΔR2 rose above 2×SD of the ΔR2 of the first 20 time points. The difference in arrival time (delay) for each region of interest relative to the AIC was determined, corrected for delays due to the slice acquisition order of the multislice echo planar imaging sequence. Mean CBF measurements are shown in table 1. The controls did not have white matter abnormalities on T2 weighted images. 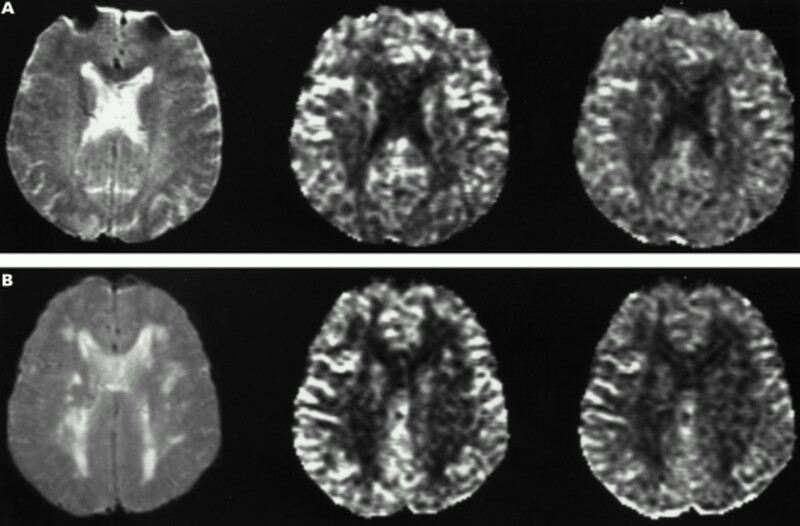 Typical images from a control and a patient with leukoaraiosis are shown in figure 1. Mean white matter CBF was significantly reduced in patients by 38% (13.40 (SD 4.87) v 21.74 (SD 3.53) ml/min/100 g, p=0.002). Significant reductions in CBF were seen in all white matter regions; 34% in the anterior, 40% in the superior, and 41% in the posterior white matter. By contrast there was no reduction in mean grey matter CBF. There was no significant reduction in CBF in any grey matter region. There was a wide range of CBF values among the different patients with leukoaraiosis (figure 2). There was no difference in end tidal carbon dioxide concentrations between patients and controls during the acquisition phase of the perfusion imaging (mean (SD) 4.97 (0.51) v 4.97 (0.71) kPa p=0.994). Typical images from a control (A, upper panel ) and from a patient (B, lower panel). In each case the first image is the fast SE T2 weighted image, the second image is the cerebral blood flow map, and the third image the cerebral blood volume map, for the same slice. Mean white matter CBF values in controls and patients with ischaemic leukoaraiosis. There was no significant difference in white matter CBV between cases and controls (table 2); mean values were lower in all white matter regions for cases but this did not reach significance for any region. By contrast, mean grey matter CBV was significantly higher in patients than in controls; in each individual region mean values were higher in patients but this only achieved significance for the occipital cortex. Mean MTT values were higher in all regions of grey and white matter in the patient group, but this only achieved significance for the superior white matter and basal ganglia (table3). There was no difference in white matter diff ΔR2 values in patients versus controls (0.010 (SD 0.07) v 0.08 (SD 0.01) s-1, p=0.7). There was no significant delay in tracer arrival time in the white matter of patients compared with controls (2.77 (SD 1.34) v 2.83 (SD 1.63) s, p=0.94). Using a quantitative MR perfusion method we have shown reduced white matter CBF in patients with ischaemic leukoaraiosis, but normal grey matter CBF. The absolute values of CBF we obtained in the patient groups were very similar to those in previous PET studies in which both white and grey matter flow have been determined.7 8 13 14 This provides further evidence for the validity of the rCBF measurements using this quantitative MR perfusion technique. Estimation of cerebral perfusion using dynamic susceptibility imaging assumes that the contrast agent remains in the intravascular compartment. If blood-brain barrier disruption and vascular leakage occurred this would invalidate the measurements. Blood-brain barrier disruption has been reported in patients with leukoaraiosis who have been reported to have higher CSF/serum albumin ratios, and this would be consistent with blood-brain barrier breakdown.17 If vascular leakage does not occur, the signal will return to its precontrast level after the bolus injection, or in the presence of tracer recirculation, the postbolus signal will be lower than the prebolus intensity. We found no difference in the postcontrast−precontrast ΔR2 difference between the patient and control group, suggesting leakage does not occur, at least during the time scale of the perfusion measurement. This is consistent with a recent study in which patients with white matter vascular lesions, some of whom had functional blood-brain barrier disruption as evidenced by increased CSF/serum albumin ratios, were imaged repeatedly over a 30 minute period just before and after a double standard dose of a paramagentic contrast medium, using a T1 weighted sequence. There was no significant change in the MR signal in the white matter lesions during this period.18 Another possible criticism of the singular value decomposition technique used to deconvolve the arterial input curve from the tissue ΔR2 time curve is its susceptibility to give erroneous flow values where the ΔR2 time curve is delayed relative to the arterial input curve. However, we found no difference in the mean delay between patients and controls in the white matter. In summary, quantitative exogenous perfusion MRI allows absolute quantification of perfusion in diffuse cerebrovascular disease such as ischaemic leukoaraiosis with a resolution similar to or better than previous methods. Using this technique our results provide further evidence for the role of chronic ischaemia in this condition. This work was supported by a grant from the Stroke Association of the United Kingdom. We thank the neuroimaging staff and in particular Amanda Glover and Caroline Andrews for their assistance in acquiring the MR data. We thank Professor Steve Jackson for allowing us to study the health care of the elderly normal control database. (1995) Leukoaraiosis. in Lacunar and other subcortical infarctions. eds Donnan GA, Norving B, Bamford J, et al. (Oxford University Press, Oxford). (1987) Leuko-araiosis. Arch Neurol 44:21–23. (1993) Pathology of small artery disease. in Advances in neurology. Vol 62. eds Pullicino PM, Caplan LR, Hommel M, et al. (Raven Press, New York), pp 93–123. (1990) Subcortical arteriosclerotic encephalopathy: single photon emission tomography-magnetic resonance imaging correlation. Am J Physiol Imaging 5:68–74. (1997) Xenon contrast CT-CBF measurements in high-intensity foci on T2-weighted MR images in centrum semiovale of asymptomatic individuals. Stroke 28:984–987. (1992) Leukoaraiosis and dementia in hypertensive patients. Stroke 23:1673–1677. (1990) Cerebral blood flow and oxygen metabolism in patients with vascular dementia of the Binswanger type. Stroke 21:1694–1699. (1996) High resolution measurement of cerebral blood flow using intravascular tracer bolus passages. Part I: Mathematical approach and statistical analysis. Magn Reson Med 36:715–725. (1998) Absolute cerebral blood blow and blood volume measured by magnetic resonance imaging bolus tracking: comparison with positron emission tomography values. J Cereb Blood Flow Metab 18:425–432. (1998) Cerebral blood flow measurements by magnetic resonance imaging bolus tracking: comparison with [15O]H2O positron emission tomography in humans. 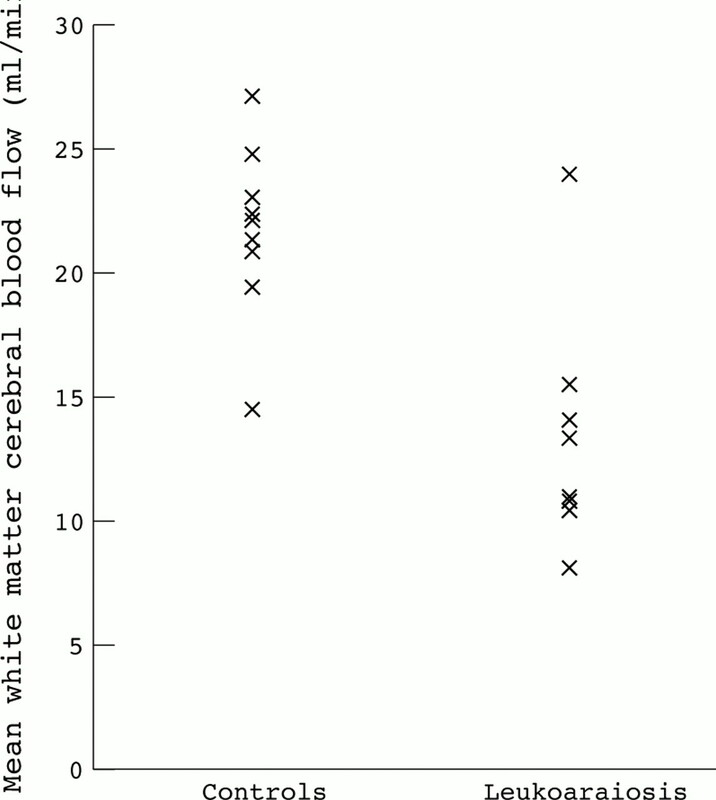 J Cereb Blood Flow Metab 18:935–940. (1997) Subcortical hypoperfusion associated with asymptomatic white matter lesions on magnetic resonance imaging. Stroke 28:1944–1947. (1998) Positron emission tomography in vascular dementia. J Neurol Sci 154:55–61. (1998) Evaluation of the ratio of cerebral blood flow to cerebral blood volume as an index of local perfusion pressure. Brain 121:1369–1379. (1995) MR contrast due to intravascular magnetic susceptiblity perturbations. Magn Reson Med. 34:555–566. (1993) Cerebrospinal fluid proteins in patients with leucoaraiosis: possible abnormalities in blood-brain barrier function. J Neurol Sci 115:125–131. (1999) Contrast enhanced MRI of white matter changes in dementia patients with blood-brain barrier dysfunction. Alzheimer's Reports 2 (suppl 1) S56.